Object detection systems, in particular face detection, have become a hot topic of research. Applications that employ this kind of systems are becoming widespread. For instance, they can be found in search engines, social networks, incorporated in cameras, or in applications for smart phones. Like in other example-based learning techniques, the datasets employed are vital, not only for attaining competitive performances, but also for correctly assessing the strengths and shortcomings of the classifiers. As such, developing adequate datasets for training, testing and validation becomes a crucial and complex process. The working hypothesis is that Evolutionary Computation can be used to assess and improve the performance of classifiers by evolving new training instances. To test it, a framework that uses Evolutionary Computation for assessment and improvement of classifier performance is proposed, developed and explored. The framework performs multiple parallel evolutionary runs to generate a large number of potentially misclassified instances. A Supervisor module determines which of the generated instances have been misclassified and which should be added to the training set. A new classifier is trained based on the original training set augmented by the selected evolved instances, thus potentially overcoming some of the shortcomings of the original classifier. The individuals generated throughout all EC runs go through a supervisor module that selects and filters instances. The EC engine, NEvAr used in this experiments is inspired by the works of Karl Sims. It is a general purpose, expression-based, GP image generation engine that allows the evolution of populations of images. The remaining set of images is added to the negative dataset and the classifier was retrained. CMU-MIT – 130 positive and negative images. The first row presents the performance of the initial classifier in terms of Hits, Misses, False Alarms and Percentage of correctly classified instances. FDLib, describes the performance of the classifier used as supervisor. IEC Average presents the results obtained by adding images generated in individual evolutionary runs to the negative training set. Manual refers to the results obtained by hand-picking which images should be added. 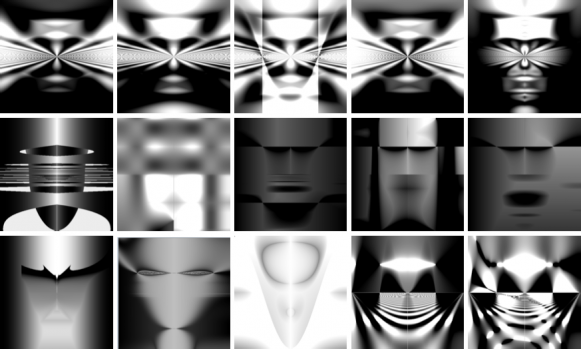 The last four rows show the results obtained by enriching the training dataset with images from different evolutionary runs. The four combinations result from using or not a supervisor module and by filtering or not the images.